A quick search for Herborn reveals it is in the area of Nassau and Dillenburg, the ancestral lands of Prince William the Silent who led the revolt of the Dutch against Spanish Habsburg rule in the 16th century and who is regarded as the founding father of the Netherlands. 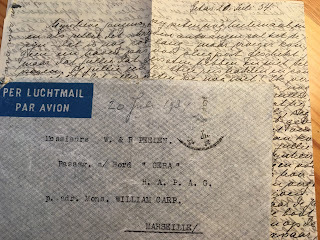 Their first-born Willi Ernst arrived in 1884 in Lennep, Germany, in the vicinity of Dusseldorf but by the time my grandmother was born in 1891, the family had moved to Tonningen, Schleswig Holstein, which is on the border with Denmark. Christoph Reith was Uber Zollinspector - which roughly translates as Head Customs Officer - and I guess all the moving around was part of the job. Doede Lawerman was Wachtmeester in the Marechaussee. The Marechaussee is the security organisation in the Netherlands which combines functions of the Police, the Military and Customs. I assume the rank of wachtmeester was something like an officer, a guardsman perhaps. 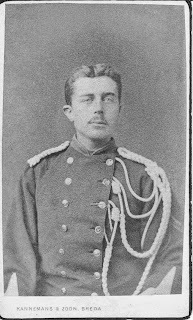 He joined the Marechaussee on 17 September 1881 and he too was moved around a lot for his work often within several months. In 1889 he moved from Eindhoven to Zwolle and then in March 1990 he moved to Zutphen, then in April 1890 he was promoted to Wachtmeester te Paard (on horse) and this must have given him the income he needed so he could marry Fokeline Dieverdine Bakker in June 1890 in Valthermonde. The young couple - well perhaps not so young, he was already 32 and she was 25 - then moved to Enschede where their first daughter was born in 1891and then to Winschoten where in 1895 my grandmother Berendina Elisabeth was born. They also had a son Wiebertus who was born in 1893. 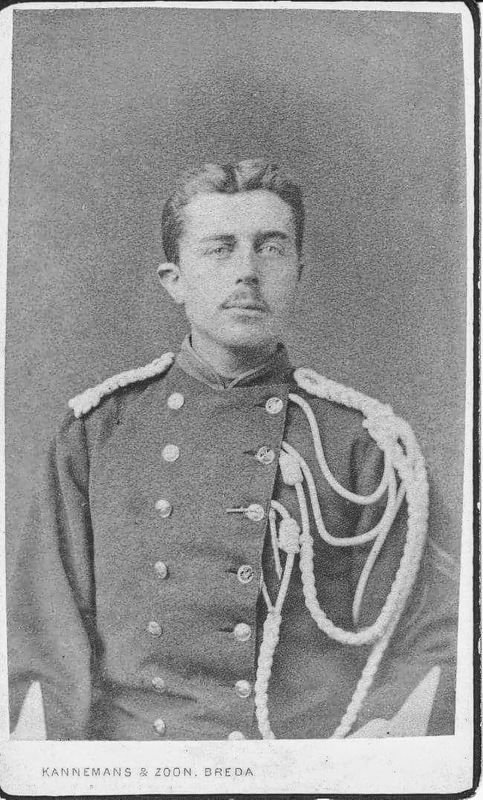 Doede had a distinguished career for he was twice awarded medals of honor - in 1896 with the silver medal of Oranje Nassau and in 1899 again with the medal of crossed swords. This later distinction would have been a promotion and so he would have had to send back his first medal. The order of Oranje Nassau is not a military distinction but a general recognition of services rendered to the community. He had to retire from the Marechaussee in 1906 at the age of 48 for health reasons - he suffered frequent migraine attacks. 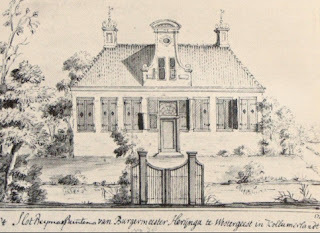 He then joined the Court of Justice in Winschoten as a concierge and later as public servant. Something caught my eye as I read down the list of vital dates for Doede and that was the note that he was baptised at the age of 29 on 18 April 1887 in the Doopsgezinde community in Sas van Gent. This looked different and worthy of investigation. The Doopsgezinde community has its roots in the Reformation era when a priest from Friesland, Menno Simons, developed his teachings that stressed the importance of baptism as an adult and the way to God was to live a peaceful life. This movement became known as Anabaptists or Mennonites as it became known internationally. I can only guess at what inspired him to radically depart from the church tradition he probably grew up with, but it does put into context the remarks of my grandmother when I asked her about religion in the family many many years ago. She said her father was some kind of humanist and "had his own beliefs". My brother and I were not christened as babies but we were enrolled in religious instruction at school so that we could make our own informed choice as adults if we wanted to. Perhaps a touch of Mennonite there? Another Mennonite teaching is not to take up arms and join the military but it was acceptable to join the Police, or Fire Brigade as compensation. So his joining the Marechausee is consistent with this. At this point I don't know much about Christoph Reith so that is for future exploration. One last note, both great-grandfathers died at the age of 68.